William J. Miller Engineers Inc. Staff is passionate about collection of high-quality hydrographic data on rivers and canals, and has over 20 years of experience collecting hydrographic data on water bodies including the Rio Grande and Pecos River. This work typically includes collecting cross-section data, longitudinal profile data, and channel bed material sampling where required. Our clients include the Albuquerque District, U.S. Army Corps of Engineers and U.S. Bureau of Reclamation, and data is collected for a number of reasons, such as updating a sediment database used for monitoring sediment deposition and scour in the channel of the Rio Grande and for preparing estimates of sediment deposited in Cochiti Lake. •	Collected cross section data, as well as longitudinal profile data where requested, at locations along the Rio Grande between Isleta Pueblo and Truth or Consequences for the U.S. Bureau of Reclamation. •	Collection of cross section data at range lines located between Otowi Bridge and Cochiti Reservoir on the Rio Grande for the U.S. Army Corps of Engineers. 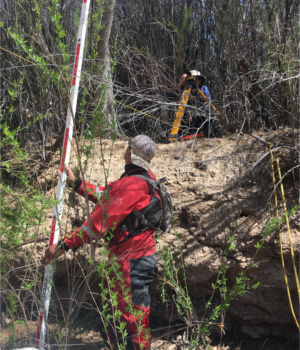 •	Hydrographic surveys of the channel of the Pecos River in De Baca County, NM at locations below Sumner Dam and above the mouth of Taiban Creek for the NM Interstate Stream Commission. These data were collected for the preparation of hydraulic computer models for estimating water surface elevations and flow velocity of the Pecos River under various flow levels. This work consisted of collection topographic data along cross sections at USGS stream gages Pecos River below Sumner Dam and Pecos River Below Taiban Creek near Ft. Sumner. These data were collected using Trimble RTK-GPS equipment and were used to assist with the calibration of hydrologic computer models used by the NM Interstate Stream Commission. A topographic survey of the channel of the Pecos River at the mouth of the Ft. Sumner Irrigation District Lower Drain outfall was performed by William J. Miller Engineers, Inc. using Trimble RTK-GPS and total station surveying equipment. The data were collected for use in calibrating the measuring flume installed in the drain upstream from its confluence with the Pecos River. This work undertaken with the cooperation of Wolf Engineering, LLC. 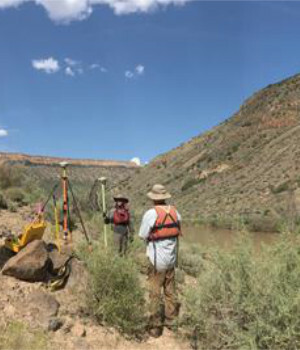 William J. Miller Engineer’s Inc. assisted Wolf Engineering with the survey of eleven sediment range lines in White Rock Canyon above Cochiti Lake. 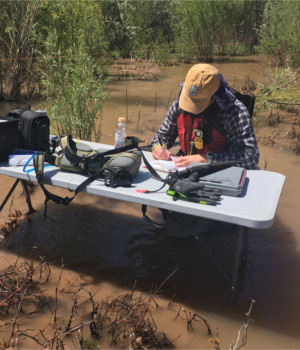 This work contributes the ongoing effort of the Corps of Engineers, Albuquerque District, to monitor sediment inflow and accumulation to Cochiti Lake. The purpose of this project is to collect total sediment load data on the Rio Grande during the 2017 spring runoff. The five rounds of data were collected between April 27th and June 20th, 2017 at five cross sections. The five rounds were spaced so that two were collected on the rising limb of the hydrograph, two on the descending limb, and one at the peak flow. The total load data collection includes a cross-section survey, a discharge measurement, a water surface slope measurement, a water temperature measurement, bed material samples, and depth-integrated suspended sediment samples. 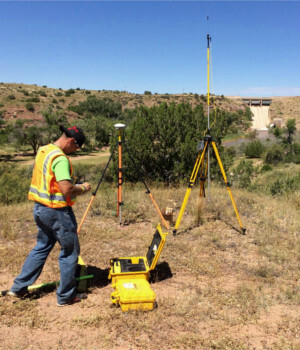 Since 2010, William J. Miller Engineers, along with Southwest Water Design partner Wolf Engineering, has performed regular topographic surveys to collect data at fixed locations along the Rio Grande between Santa Ana Pueblo and Truth or Consequences, NM. These data are collected for the Bureau of Reclamation to assist in their efforts to monitor the transport and deposition of sediment in the channel of the Rio Grande.